Some protesters detained at the Occupy Montreal site last week are upset with the method police used to identify them. They said officers tagged them with a black ink on one hand and ultraviolet ink on the other. The protesters are thinking of filing a complaint against police and they're questioning the legality of their tactics. "I have some doubts as to whether it is legal to mark an individual who hasn't been charged," said protester Ben Godin. "They had my picture and they had my ID. I thought that was sufficient." Human rights lawyer Julius Grey said police overstepped their mark. "I think it's something that requires either an order from the court,or the person's permission," he said. 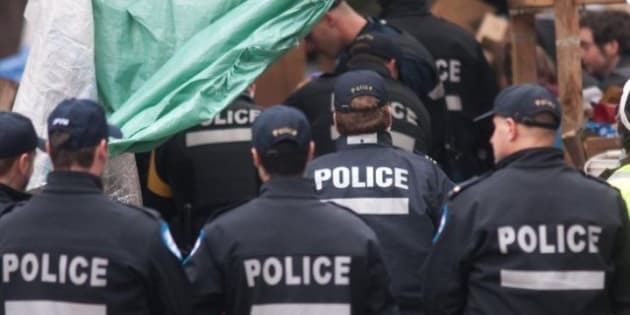 Montreal Police would not comment on whether or not they had used ultraviolet pens during Friday's raid at the Occupy site, but said they have used them in the past.